You are welcome to download it, and start enjoying it right away. Kalós also includes New Testament and koiné vocabulary, including biblical names, which makes it a very useful resource for religion and theology scholars. It has versions for both Windows and Mac, and you set up language/font preferences the first time you start the program. It is indeed free and fully functional, but to get rid of an occasional nag screen, you can purchase an activation key for US$29. The dictionary works as you would expect. When you type in the dictionary form of a word (either typing in Greek letters or using Beta code), you can use diacritics or ignore them and specify a part of speech in order to speed up the search. 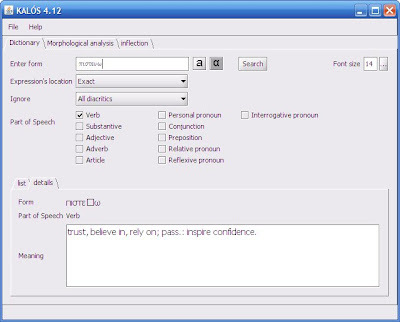 The morphological analysis tool is similarly helpful for entering any form. 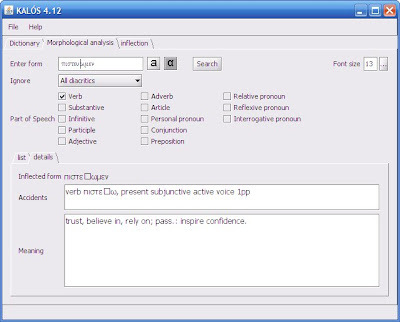 Perhaps most helpful is the inflection tool. Using the word you entered in the Dictionary tab, the inflection tab lets you generate tables based on that word and then save the table in PDF, HTML, RTF, CSV, or XLS format. It is a classical Greek tool (so you have the option to include dual forms or Doric infinitives), but it includes most Koine Greek vocab including biblical names. All in all, a fine Greek resource you may wish to add to your collection. In another post, I will describe additional ways of creating paradigm charts using other software resources.